Declares That He Has Never Seen Gentry But Once in His Life. “Tom Felder is a contemptible liar,” blazed Chief Lanford last night when informed of the contents of Colonel Felder’s letter directed to him through The Constitution. “I never saw this Gentry but once in my life, and that was before this dictagraph exposure ever happened. I have never seen him since. 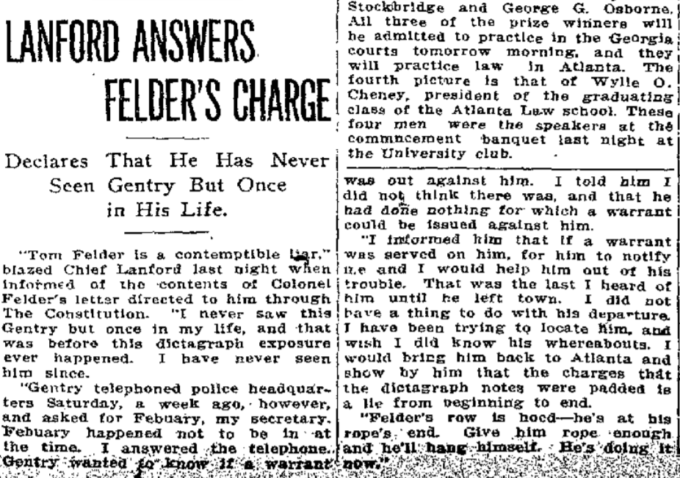 “Gentry telephoned police headquarters Saturday, a week ago, however, and asked for Febuary, my secretary. Febuary happened not to be in at the time. I answered the telephone. Gentry wanted to know if a warrant was out against him. I told him I did not think there was, and that he had done nothing for which a warrant could be issued against him. “I informed him that if a warrant was served on him, for him to notify me and I would help him out of his trouble. That was the last I heard of him until he left town. I did not have a thing to do with his departure. I have been trying to locate him, and wish I did know his whereabouts. I would bring him back to Atlanta and show by him that the charges that the dictagraph notes were padded is a lie from beginning to end.